I grew my tomatoes using the method described on the website (www.vegetable-garden-guide.com/how-to-grow-tomatoes.html) this year. Preparing greenhouse soil, hole in underside of growbag, using a planting ring, planting tomatoes in growbags and filling ring when plant was tall enough to encourage more feeding roots from the stem. I have had amazing results. The best tomatoe crop in years! I've been growing tomatoes for about 25 years in total! I had a nasty few caterpillars eat away some leaves but this was soon taken care of.... It was around early June and I found out it was a type of moth that loves tomato leaves. A small frog took delight in making me jump when he leapt out during watering! But he took care of the slugs! I would say that two plants per bag worked, but I will investigate how much grow bag soil was left root free.... I might try three plants next year....Amazing results and still more to ripen..... First tomatoes picked mid July and still picking! 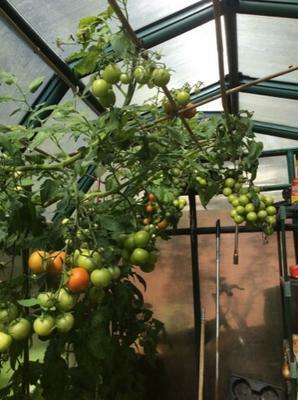 I choose to plant two tomato plants per bag to give enough room for air to circulate. But that's a personal choice, it would be interesting to know the results of three plants per bag should you go ahead. I wish you all success for next years crop!